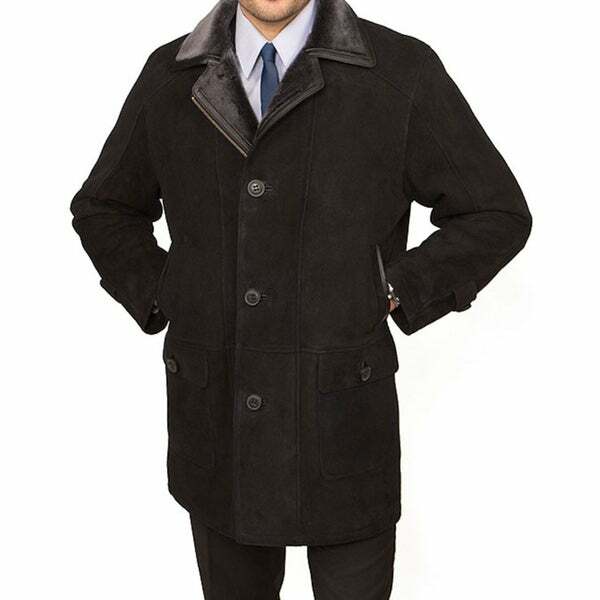 Enjoy rustic warmth with urban elegance with this coat from Tatto di Pelle. Available in whiskey or black to coordinate with your wardrobe, this 3/4-length coat is a versatile piece that's comfortable enough for everyday casual wear yet smart enough for the office. Luxuriate in the plush softness of the genuine lambs fur interior of this shearling coat. Keep your essentials organized and close at hand with the four outside pockets and a hidden interior pocket. Stay warm even on windy days with the secure button-and-zipper closure. Available in a range of sizes to fit almost anyone, this coat makes a wonderful gift as well as a fine addition to your own collection. My husband loved this coat as well as myself. Most "real" shearlings" cost much more than this one. The quality was superb and the warmth couldn't be beat. Excellent buy. Love Overstock! The coat arrived today for my spouse’s Christmas gift! I thought it was a different coat because it had a detachable hood and was by Ashton! Well, maybe it is, but I simply love, love, love the coat and can’t wait for him to open the box on Christmas! It is a beautiful coat and appears to be high quality! Purchased this item for my son at Christmas. He loved it. So classic, and the warmest coat he has. Generous sizing. Beautifully made, nice fit and detailing. Great value for the price. I had seen a similar jacket at another retailer for $1800. I paid an outstanding price for mine, and people will think I paid more and got an exceptional deal. Yes it is water resistant. The majority of rain will run off the coat. For any rain that collects, hang the coat inside out to dry. "My husband wears a 40 in a suit / sport jacket. However, he is a 32" pant and a large in a sweater. Would he purchase a medium or a large? Thank our! N.R." Hello Rubin.nori, we would recommend trying a size medium. Thank you for shopping with us. "tp92203 shearling coat,where this one have been made?It this a real sheepskin?What is a true color?How to choose a right size for coat?How heavy it is ?" Hello Lilia, you would choose the color option from the drop down tab. We have black or brown available. Here is a size guide to help you choose the size http://www.overstock.com/sizing.html#men This is made in the USA with real sheep skin. The weight is approximately 1 pound. Have a great day! Needed an inexpensive shearling lamb jacket. This was exactly what I was looking for. Hope it fits true to size. "I have a 48" chest and a 38" waist. I am 6'2" tall. Should I get an XL or XXL?" Hello Badyak, I think an XL should work. Please let us know if you have any further questions.